It is sometimes useful to be reminded that we aren’t as smart as we sometimes delude ourselves into thinking. And this has considerable bearing on ministry and on theology. What reminded me of this was two-fold. Yesterday, I was teaching Cultural Anthropology, and my students kept asking questions that I could not answer. Truthfully, most of the questions were ones that no one could answer— or at least answer with justified confidence. Instructions: Read each question carefully. Answer all questions. Time limit 4 hours. Begin immediately. Work in numerical order (equipment remaining from question 1 may prove useful with questions 3 and 6). Medicine. You have been provided with a razor blade, a piece of gauze and a bottle of Scotch. Remove your appendix. Do not suture until your work has been inspected. You have 15 minutes. History. Describe the history of the Papacy from its origin to the present day, concentrating especially but not exclusively, on its social, political, economic, religious, and philosophical impact on Europe, Asia, America, and Africa. Be brief, concise, and specific. Public Speaking. Two thousand drug-crazed aborigines are storming the classroom. Calm them. You may use any ancient language except Latin or Greek. Biology. Create life. Estimate the difference in subsequent human culture if this lifeform had been created 500 years earlier, with special attention to its probable effect on the English Parliamentary system. Engineering. The disassembled parts of a high-powered rifle have been placed in a box on your desk. You will also find an instruction manual printed in Swahili. In 10 minutes, a hungry Bengal tiger will be admitted to the room. Take whatever action you feel is appropriate. Be prepared to justify your decision. Sociology. What sociological problems might accompany the end of the world? Construct an experiment to test your theory. Management Science. Define management. Define science. How do they relate? Create a generalized algorithm to optimize all managerial decisions. Assuming a 7600 CPU supporting 50 terminals, each terminal to activate your algorithm, design the communications interface and all necessary control problems. Economics. Develop a realistic plan for refinancing the national debt. Trace the possible effects of your plan on these areas: Cubism, the Donatist controversy, and the wave theory of light. Psychology. Based on your knowledge of their works, evaluate the emotional stability, degree of adjustment and repressed frustrations of each: Alexander of Aphrodinias, Ramses II, Gregory of Nicea, and Hammurabi. Support your evaluation with quotations from each man’s work. It is not necessary to translate. Classical Physics. Explain the nature of matter. Include in your answer an evaluation of the impact of the development of mathematics on science. Modern Physics. Produce element 107. Determine its half-life. Energy Resources. Construct a working fusion reactor. Philosophy. Sketch the development of human thought. Estimate its significance, and compare with the development of any other kind of thought. General Knowledge. Describe in detail, briefly. Actually, it is good to remember that one is not that smart. Our identity as humans starts from the recognition that we are not God. We are limited beings— limited in time, space, power, knowledge, and understanding. This is true in terms of theology as well. Stephen Bevans suggests that in all theological reflection, we must be humble. Millard Erickson describes good theology as tentative. Some might balk at this. Many theologians (arm-chair or otherwise) and ministers seem to be awfully certain that what they believe is true. Their argument for this confidence is often built around the logic that they simply believe what God revealed in His word. That may seem sound. If the Bible is fully reliable, it may seem reasonable to suggest that our own theology should also be fully reliable. The problem is that theology is a contextual interpretation of divine revelation. As such it is a human construct. So a person who is 100% confident in their own theology is 100% confident that they can comprehend and interpret God’s message and intentions as it applies to their own context. Frankly, none of us are that smart. A bit of humility, recognizing our limitations is a wise start to hermeneutics, theological reflection, and ministry. Our faith should be in God, not in ourselves. Can Bad News Still Point Us to the “Good News”? I read an article recently (not sure I could figure out which one) that said that Pat Robertson of 700 Club/CBN fame would not allow testimony stories on his show where God did not answer the prayer of the testifier. Or to be more accurate, God did not do what the praying person wanted God to do. Is that true? I have never seen 700 Club so I don’t know. But I know the temptation of many churches, and not merely those that preach (material) prosperity, to seek “happily ever after” testimonies. To encourage unbelievers to accept the Gospel (Good News) and believers to trust God more, it just seems to make sense to tell stories of God granting what we want. But there are problems with this. I think some testimonies of “bad news,” meaning not getting exactly what we want, can be useful to point us to the Good News, or strengthen our trust in God. Some “bad news” stories can be more inspirational than other stories. Joni Eareckson Tada’s life story, or the story of Fanny Crosby would not be more inspirational if Joni was healed of quadriplegia or Fanny of blindness. Many of us really need to know that an abundant life is still attainable in whatever state we are in. If God’s benevolence can only be seen in the lives of the healthy and wealthy, how can the downtrodden visualize a great future that still dovetails with there present condition? “Bad News” stories can help us be sympathetic with those whose lives are painful. I can’t help but think the theology of Job’s friends would be a little better nuanced if they had suffered in ways that they could not connect to their relationship with God. A friend of mine had skin problems. Well-meaning Christians would suggest all sorts of things to “fix” him. That is okay I suppose, although it certainly gets old. Others would try to sell him stuff to solve the problem. This is a bit self-serving, but perhaps they honestly thought they could help. Others would subtly, or not so subtly, suggest that he had sin in his life, or perhaps his ancestors who had sinned. Not all that helpful, frankly. Skin problems are especially difficult because they are visible. People can hide other problems, and look like things are okay. But humans can only see the external, and skin problems are external. Much of Job’s suffering was in the boils, and much of the suffering in the boils wasn’t physical, but social. Job needed more sympathy and support, not finger pointing. He needed friends who were not only familiar with Deuteronomy and Proverbs, but also Ecclesiastes, Jeremiah, and I Peter. “Bad News” can strengthen faith. This seems a bit counter-intuitive, yet our faith in God as our Good Shepherd is not only found in His bringing us to greener pastures and stiller waters, but also in leading us (and protecting us) through the valley of the shadow of death. For us, a few years ago, we had a major financial setback. It was of a sort that we were pretty sure that one or both of us would have to leave the mission field. However, we kept delaying going back and delaying going back. God did not suddenly deluge us with new financial support… just a trickle. But it has been enough. We have been able to more than survive. Before, we could quote verses like in Matthew 6 where Jesus talked about the Father knowing our needs and His intention to care for us. But in living that out with God sustaining us, despite Him never completely reversing the situation, has definitely increased our faith. Frankly, I believe that testimony would strengthen/embolden a Christian in ministry more than several “Praise Jesus” TV testimonials. The writer of Hebrews in chapter 11, a section known as the “Hall of Faith,” sought to strengthen the faith of young Jewish Christians by looking back at Old Testament saints. Half were happy and half were sad. In some cases, God gave victory and vindication, and in some God comforted those who were faithful despite torture, killings, and losses. We need both sides. “”Bad News” can empower our theology. I periodically get responses from students or ministry partners where they struggle with the fact that God doesn’t seem to be answering their prayers. For many, the theology they were taught suggested that through the right kind of prayer, they could get God to be their servant, rather than they becoming His servants. Flabby theology is disconnected from reality. A strong theology is reflective and iterative. Our theology should help us through the dry and cold times in life, not just the rosy and lush. Is this important? Absolutely. Our theology is tied to our sense of purpose, and our ethics. A good theology gives us an understanding of who we are, and our relationship with both our world and our God. A theology that misrepresents these areas will not stand well when our circumstances change. And if bad theology leads to bad ethics (understanding of what we should do and should be), our responses to adversity are likely to lead to wrong, or at least unproductive, activities and thoughts. Our continual need of God’s care makes us more dependent on God. Having all of our prayers answered, can make us forget God. We are forgetful people. We need some bad news to remember that one who cares for us. Contextualization attempts to communicate the Gospel in word and deed and to establish the church in ways that make sense to people within their local cultural context, presenting Christianity in such a way that it meets people’s deepest needs and penetrates their worldview, thus allowing them to follow Christ and remain within their own culture. This function seems at first to be self-evident, but it is clear we have not always done mission in this mode. Why, then, this sudden burst of energy and excitement, at least in the academy, about this notion of contextualization? I believe the answer lies partly in the postcolonial discovery that much of our understanding and practice of faith has been shaped by our own culture and context, and yet we often assumed that our culturally conditioned interpretation of the Gospel was the Gospel. We are now beginning to realize that we have often confused the two and have inadvertently equated our culturally conditioned versions of the Gospel with the kingdom of God. Unfortunately, when Christianity is not contextualized or is contextualized poorly, then people are culturally offended, turned off to inquiring more about who Jesus is, or view missionaries and their small band of converts with suspicion as cultural misfits and aliens. When people are offended for the wrong reason, the garment of Christianity gets stamped with the label “Made in America and Proud of It,” and so it is easily dismissed as a “foreign religion” and hence irrelevant to their culture. When this happens, potential converts never experience the offense of the Gospel because they have first encountered the cultural offense of the missionary or Westernized Christians. A third function of contextualization in mission is to develop contextualized expressions of the Gospel so that the Gospel itself will understood in ways the universal church has neither experienced nor understood before, thus expanding our understanding of the kingdom of God. In this sense contextualization is a form of mission in reverse, where we will learn from other cultures how to be more Christian in our own context. First of all they were all pretty competent spies. They went into the land, did surveillance, and came back out and gave a fairly accurate picture of the land and its inhabitants. In that sense they were good. Second, they were probably considered generally good people anyway. They were part of the leadership of their respective tribes. Of course being recognized as a leader doesn’t mean that one is good (far from it). However, Moses probably chose these leaders. Moses had a tendency to be a bit of a micro-manager, after all. But there is a different interpretation. What if the ten spies had TOO MUCH faith. Or perhaps it would be better to say, too much of the wrong kind of faith. Consider their recent history. The Israelites were helpless to leave Egypt, and God miraculously brought them out. The Israelites were helpless trapped between the Egyptian army and the Sea of Reeds, and God miraculously brought them to safety. In the following months, the people of Israel complained about bitter water, lack of food, and lack of meat. In each occasion, God miraculously solved their problem. In each case, Israel’s helplessness brought about God’s miraculous response. It is possible that these leaders picked up the pattern all too well. They come back and said, “The task is too big, the enemy is too strong. We are too weak. We can’t do it. We should go back to Egypt.” They expected Moses to come back an say. “God wiped out your enemy, go ahead and enter at your own leisure.” But God did not do things that way. 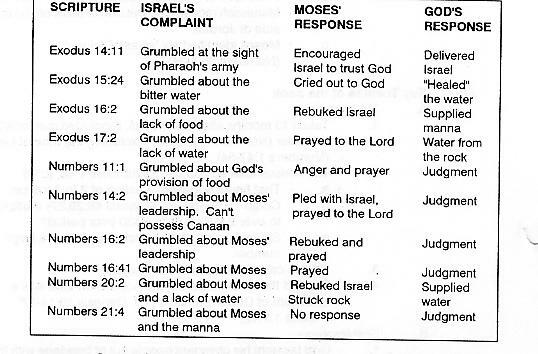 As the figure below shows, God responded positively to grumbling and complaining about 50% of the time during the wilderness sojourn. Here He said, “Too bad. Wander around in the desert for decades.” At that point, it is obvious that the declaration of going back to Egypt was only a ruse. Once that ruse failed, they were all motivated to push forward into Canaan… and failure. If this scenario is true, the spies were not bad people necessarily. They also were not bad because they lacked faith. Rather, they perhaps were bad because they had the wrong kind of faith. About half the time God did what the people wanted, and half He didn’t. The bad faith they had was a faith in themselves in knowing what God will do. They believed they had “figured God out.” If they whine and complain and act helpless, God would do what they wanted. Taking a Name it and Claim it attitude regarding life as if God is our servant rather than vice versa. Grabbing promises that were given to other people and saying that they apply to us. (A strange form of thievery indeed). There are a lot of books out there on the market that talk about how certain prayers, or certain prayers said the right way, or some other form of spiritual discipline has “power,” — meaning that God will answer the prayer positively when otherwise He might be of a mind to respond negatively A good faith is based on the object of our faith rather than presumptions about our own discernment. As such, the words of Caleb and Joshua seem a better faith. They stated that if they obey God, God has promised victory. This is certainly better than trying to presuming how God would give them victory, or trying to manipulate how. This same good faith is demonstrated in Daniel 3:16-18. The three knew God and His faithfulness, but did not presume how He would respond in a specific setting. So maybe the children’s song is correct. Two spies had faith in God that led to obedience, and ten spies had faith in their ability to manipulate God. Indeed ten were bad and two were good. One of the challenges in the Bible is that in Greek thinking, there was at least two very different ways to look at perfection. Aristotle listed three, but two of them overlap considerably. One can think of the perfection in terms of Substantive Perfection, or Functional Perfection. In one case, perfection is seen as something absolutely complete, inherent to the item, and lacking the possibility of being improved upon. The other means that it meets the need or function it was designed for… perfectly. As such, the perfection is not inherent but in its role. In the former understanding, perfection is static, final, unchanging. With the latter, there is no such assumption. Consider Jesus in Luke 2:52. Most of us would see Jesus as perfect. The passage speaks of Jesus growing in wisdom and stature, and in favor with God and man. With the first definition, Jesus would be transitioning towards perfection but as a child would be imperfect. However, with the latter definition, children are suppose to learn, grow, and develop. As such, there is no reason to presume that Jesus was imperfect as a child. He was growing exactly as a child should. Likewise, Jesus scars after His death and resurrection are not imperfections, but demonstrations of God’s perfect faithfulness and power. For me, a useful metaphor for the perfection of the saints is not in line with the Holiness movement… or with linking perfection with holiness at all. If we are called for perfection, even though we are flawed and constantly changing, it seems as if we have to see perfection as unattainable—- OR we have to rethink our understanding of perfection. Anyway, I am still researching. I may change my mind still. But my hypothesis of perfection being a more dynamic rather than static quality appears to be good… so far. I am happy to say that I don’t hear this much anymore… the idea that the gospel message needs not be contextualized or made to be recognized relevant to the hearer. On occasion, one hears someone quote Isaiah 55:11, believing that God word accomplishes what it is supposed to do, despite us. Usually, rather than attacking contextualization, what is challenged is the motive behind contextualization… the belief (or perhaps fear) that contextualization is some sort of pluralistic relativism, diluting the Christian faith. Can it be that? I suppose… one can interpret almost anything as anything… that is the characteristic of pure symbols. However, such fear can be a lazy excuse to use just one presentation of God’s message, even where such a presentation would in all probability be a failure. Or it may be a lazy or selfish choice to not understand others. Let’s consider a rather extreme case of bad contextualization of the Gospel. It is the story of Emperor Atahualpa, and the Conquistador Pizarro. You can read the story in one of my previous posts… HERE. This version of the story is from Jared Diamond in “Guns, Germs and Steel: The Fates of Human Societies.” Look at the method of presentation of the Gospel, and the results. A. The friar was offering to teach the people to be friends of God. This focus on discipleship certainly places it superior to calls for belief without Lordship of Christ, or a call even to follow Christ in any meaningful way. B. The message of Good News was actually from God’s Word, the Bible. In fact, the friar gave the Emperor the Bible, and sought to help him use the Bible. This certainly places it superior to presentations that are more logical or clever, but clearly outside of utilizing the whole of Scripture. So if this was such a good presentation of the Gospel, why did it fail so miserably. (Frankly, I hope most readers would identify the killing of thousands of non-Christians and the subjugation of the rest as an undesirable result of a gospel presentation.) Many of the problems with the presentation were due to the cross-cultural gap that had to be bridged. But there were other problems as well that may not have as much causation from poor contextualization. Let’s consider the contextual issues first. The Word of God wasn’t really presented in a way where it could be responded to. The Incan Emperor did not know how to read Latin, so he could not have read it, to say nothing of responding to it after understanding it. Giving the Bible to someone who can’t understand it, thinking it will have a positive result is quite foolish. The power of the Bible is in the message it conveys… not some magic associated with it, and not the physical structure of the Bible. The Bible was not even in a medium that the Emperor could appreciate. The Incans had no written language, so he had no concept of written language. He did not even know how to open the book. The present the Bible utilizing a medium that the people cannot connect to is much like establishing a Christian radio station in the 16th century— an impressive accomplishment, but no one will be able to receive the message. They won’t even know that there was a message being sent in the first place. The message was given disrespectfully. When the Emperor did not know how to open the book, the friar tried to reach up to help. The Emperor was angry. Probably, although I am just guessing, the behavior was inappropriate when dealing with the Emperor. Of course, making the emperor angry through a social faux pas is quite likely to drive a wedge between the two rather than leading to agreement. The behavior of the friar and Pizarro was thoroughly ethnocentric. It was so ethnocentric that when the Emperor tossed aside the Bible (tossing something he had never seen before– and did not look all that interesting since he could not read), the friar called them enemy dogs and the Emperor a tyrant. In all likelihood the friar did not know the Emperor well enough to know if he was a tyrant. He may well have been no more of a tyrant than the Spanish royals. Calling them dogs is a disappointingly classic form of dehumanization and of self-elevation. In the 1500s explorers and theologians struggled with the question of whether the strange beings they found in other lands were truly human or not. The wise of that time didn’t know the limits of what is, so it is understandable if there was some confusion. Still, if one was actually superior, it hardly seems appropriate (or even necessary) to degrade the others further. Certainly presuming that their deaths were less of a tragedy than one’s own people, qualifies as ethnocentric. Mixed motive. Pizarro was a conquistador… driven forward by the desire for conquest (thus the term “conquistador”) and wealth. The friar actually joined the group because of his desire for plunder, not hearts turned to God. Mixed allegiances. Pizarro calls for the Incans to be subject to God, the the King of Spain, and the Roman Catholic church. It is understandable that missionaries sometimes identify themselves with their nation of origin or their own denomination so strongly that they struggle in separating those allegiances from allegiance to God. History does have many stories that may lead one to concern about mixing denominationalism (or creedalism) or nationalism, with allegiance to God. Mixed methods. Mixing the message of God’s desire to make peace with all mankind with an army bent on destruction and colonization certainly sends a double message. I think it is safe to say that contextualization, and proper motivation has a strong effect on how people respond to the Gospel.